I had a few deadlines this week which have kept me from posting! First project up was to finish a second quilt for the Springville Museum of Art Quilt Show. I created the pieced top while in Fountain Green a few months ago and was able to quilt the top in a way I REALLY liked. After blocking the quilt, while trimming the top, the quilt told me I needed to be more drastic in my trimming. I do hope I'm not the only one! This one said I should get rid of some sections of black. I chalked out the lines and decided to sleep on the decision. 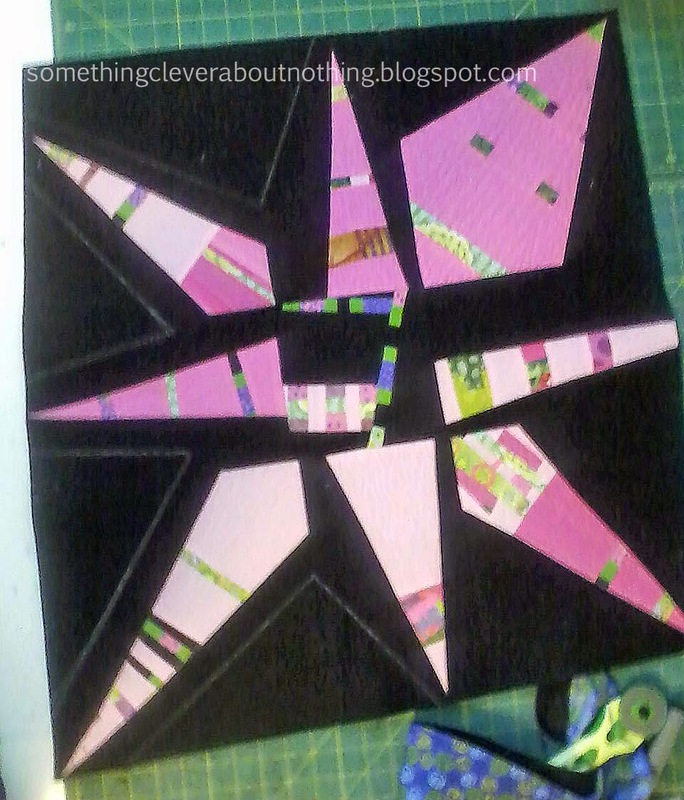 I wasn't sure I wanted to cut out all that pretty quilting! When I came back to the quilt the next day, it yelled "YES! YES! GET RID OF SOME BLACK!" So I ruthlessly took the rotary cutter and chopped out the black bits I'd chalked in and then finished it with a facing, a sleeve and a label all before midnight the night before the deadline! But then I forgot to take a photo of the finished quilt. Oh well we will have to wait to see the finished piece when I take a photo later at the show. Next I really wanted to complete a 3-D project for the "What's For Dinner?" quilt exhibit at Houston. I got to work on the project and was making real progress when I hit a big snag. This is what happens when you don't leave yourself enough time to deal with snags before the deadline. I'm disappointed in myself but I suppose it was a good learning experience. 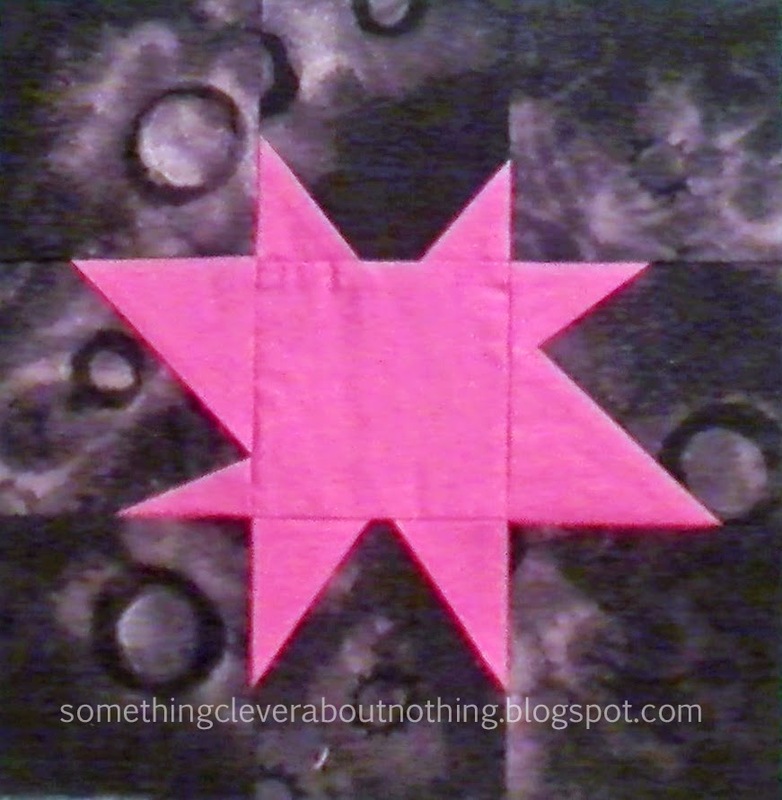 And finally as an in-between project I decided I would make a star for the Astronomical Quilts! Block Challenge. I really wanted to use a piece of fabric I created in Carol Soderlund's Dyeing to Discharge Class last fall. I thought the discharged fabric looked astronomical and so I set to work. I decided to cut corners (haha a pun) and use rectangles instead of squares BUT I didn't get my math right. First off it turned out to be 9.25" unfinished so I picked it apart and gave it tiny seams so that it was a 9.5" unfinished block, HOWEVER then my friend pointed out that my points would end up in the seams. So much for that star! I started over and made a wonky block. I was lucky to have enough fabric left for the back ground! Unfortunately I took the photo with my phone before sending it off in the mail and the color isn't quite right but it gives you an idea of the block. I really like the way this one came out. The Astronomical quilts! 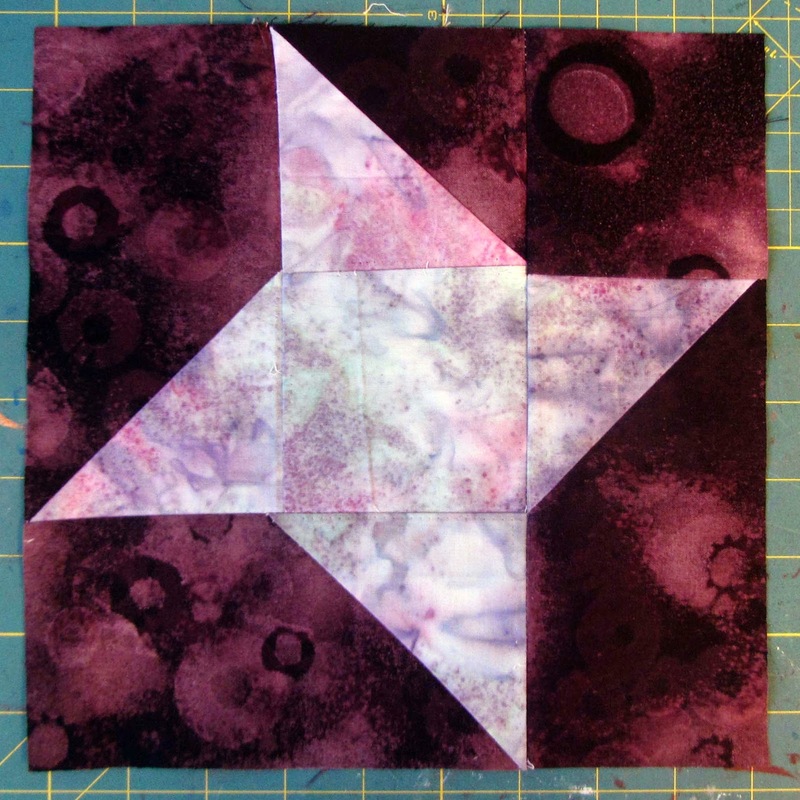 Block Challenge is asking for star themed blocks which will be paired with a block that NASA Astronaut Karen Nyberg created in space and then they will be displayed at the 2014 International Quilt Festival in Houston, Texas. There is still time to send in a block! You can find all the details here. Will you be making a star themed block to send? Good thing your friend was right and you made another block!